Fried Catfish Po-Boy, oh boy, oh Boy! Nothing screams N’awlins more than a Po’Boy, and fried catfish is about as Down South as you can get. This is hands down one of our most favorite sandwiches of all time, and you won’t believe how easy it is to make at home! This sandwich is steeped in history and flavor. Watch us show you how easy it is to make this iconic sandwich in your very own kitchen! 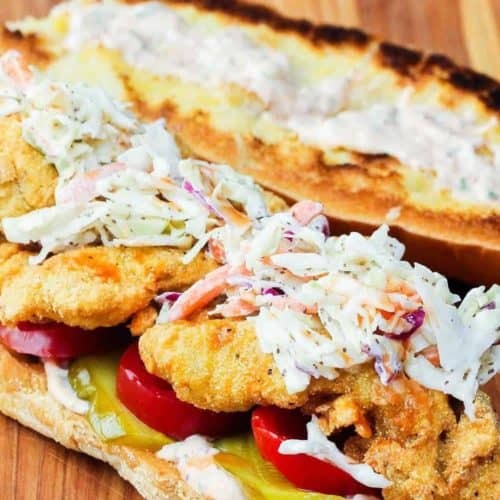 A cool, crisp dressed slaw is a very traditional topping for a Fried Catfish Po-Boy. Beside providing a nice flavor boost, the cool tastes is the perfect match to the little spice from the obligatory hot sauce that always tops a traditional po-boy. You can use fresh sliced cabbage, or you can easily buy pre-washed bagged slaw and quickly make your own dressing. You can usually find fresh catfish in the seafood department of most major supermarkets. 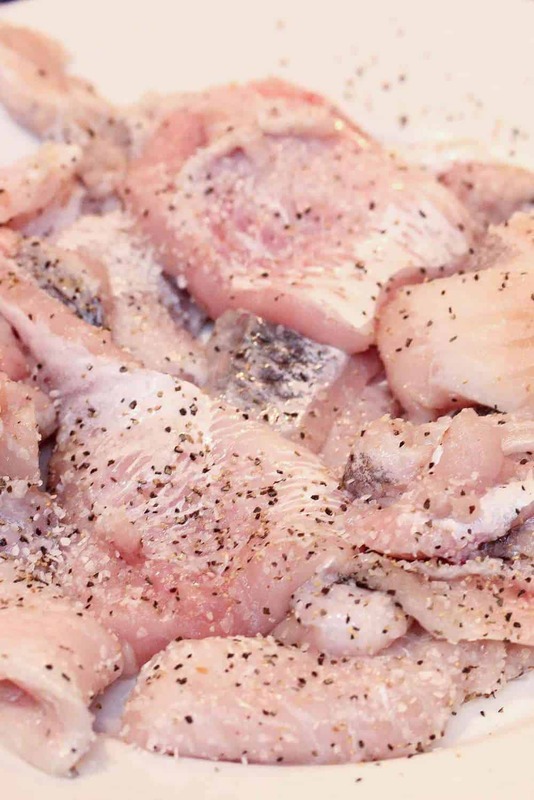 All you need to do is cut the fish into small 1 to 2-inch pieces and then hit them with some salt and pepper. 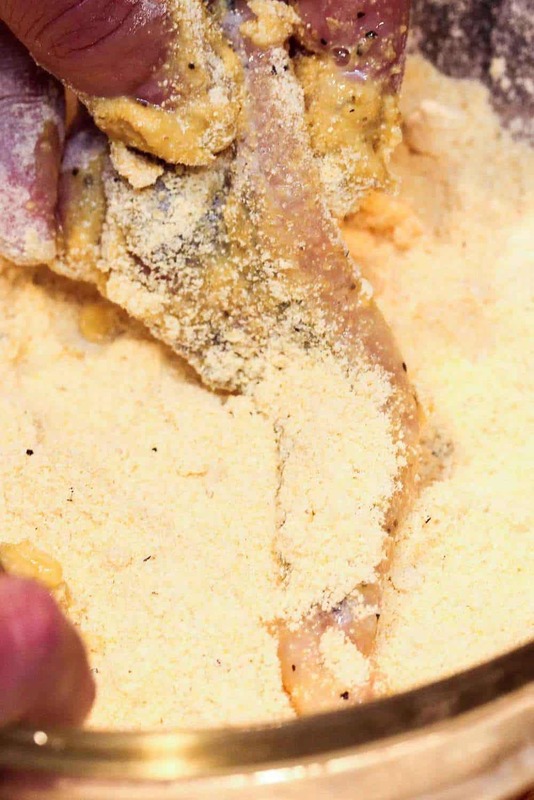 Next, all you have to do is dredge the seasoned fish in an egg/milk wash, and then into the traditional corn meal. Set up a dredging station consisting of three bowls and the task is quick and simple. This is start of the perfect fried catfish po-boy. Once you carefully lower the breaded catfish into the hot oil, it fries very quickly. Before you know it (just two or three minutes), you have perfectly golden catfish fillets for the best Po-Boy sandwich you’ll ever try. 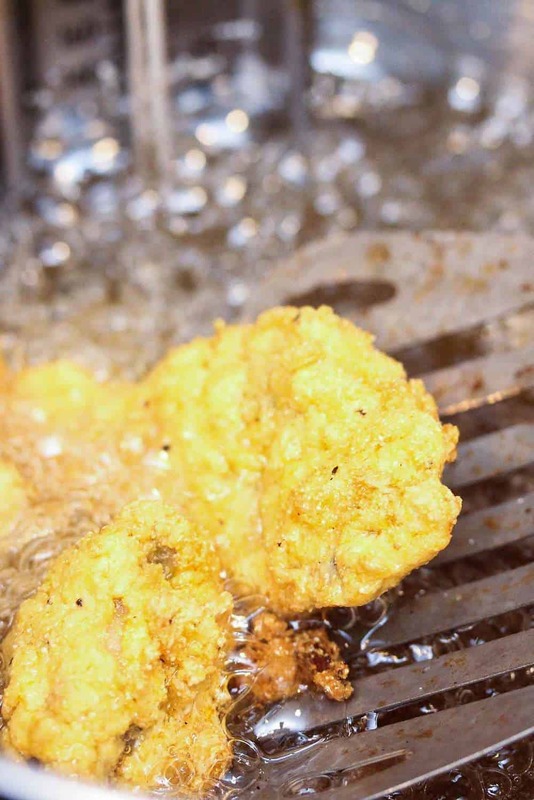 We love all kinds of Po-Boys, from fried shrimp to fried oysters. 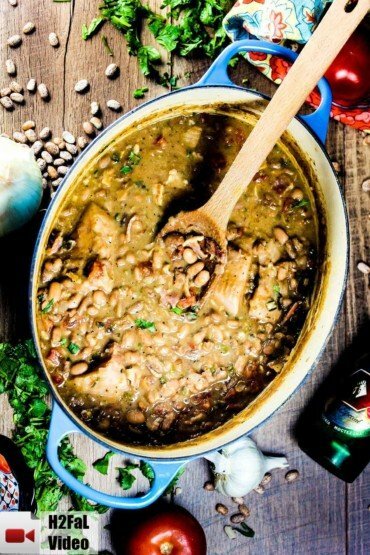 Learn more about the amazing cuisine of New Orleans here. 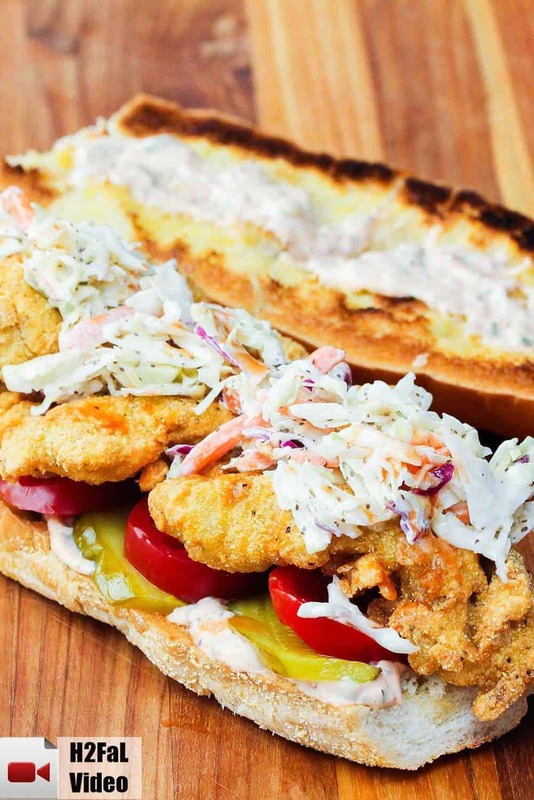 Fried Catfish Po-Boy is one of our favorite dishes to order every time we hit the Big Easy, and it’s one of our favorites to re-create at home. 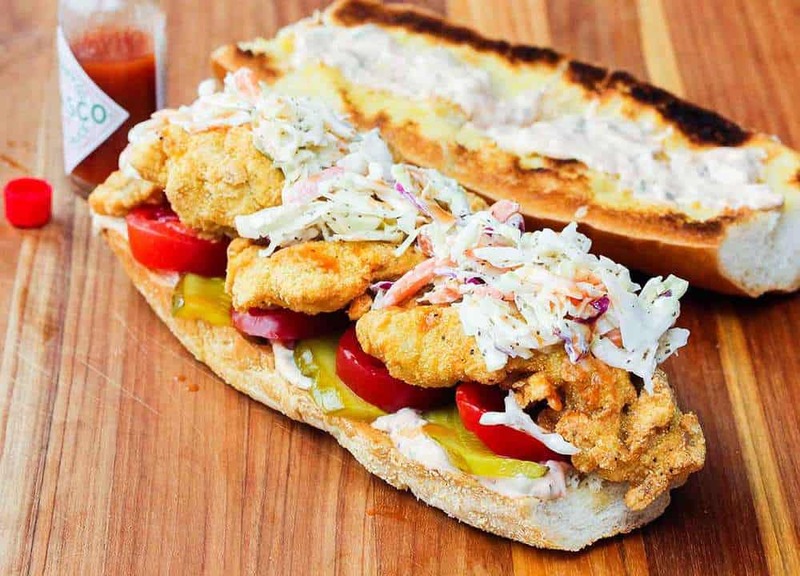 This Fried Catfish Po-Boy is about as classic New Orleans cuisine as they come. You can of course go with fried shrimp, or whatever you like...but we love it with classic Southern fried catfish! Be sure to make the Kickin' Remoulade Sauce! Before you start...make the Kicken Remoulade Sauce! 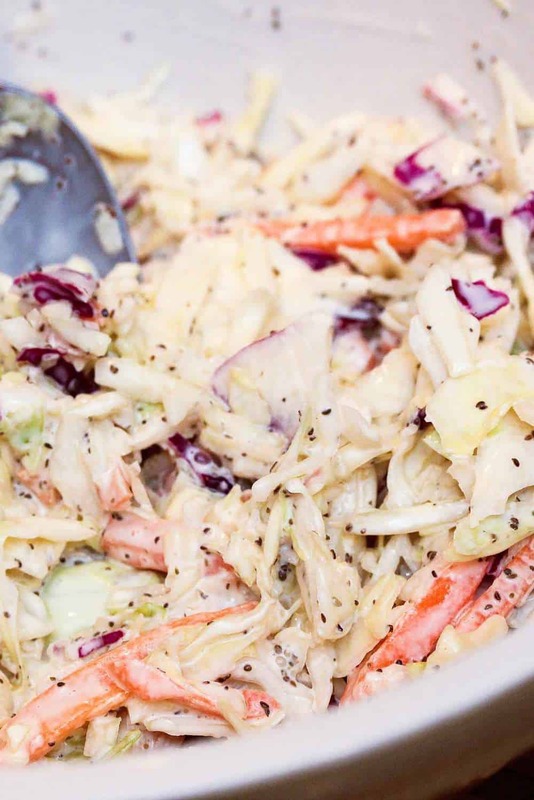 Combine the coleslaw mix, mayonnaise, vinegar, sugar, and celery seed in a medium bowl. Set aside. Heat the oil in a large sturdy skillet over medium-high heat, until reaches 350° F, or when a small piece of bread sizzles and browns in about 30 seconds when tossed in the oil. Place the milk and eggs together in a medium bowl, and gently mix. In a separate medium bowl, mix together the corn meal, flour, 1/2 teaspoon salt, 1/4 teaspoon pepper, cayenne. One at a time, dip the catfish fillets into the wet mixture, then dredge in the corn meal/flour mixture, completely covering the fillets. In batches, fry the fillets until golden brown, about 3 - 4 minutes. Drain on paper towels. Position a rack 6 inches from the broiler and heat on high. Arrange the rolls cut side up on a baking sheet and toast until golden brown, about 30 seconds (keep an eye on them!). To assemble: smear a good helping (about 2 tablespoons) of the remoulade sauce on the bottom roll. Then add a layer of the pickles, then tomato slices, then the catfish fillets, and top with coleslaw. Add a good few squeezes of fresh lemon and several dashes of hot sauce. Top with bun. Serve at once.